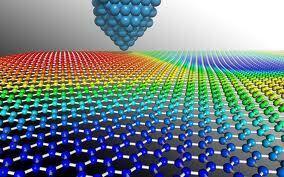 Graphene is a one-atom thick sheet of pure carbon crystals. The atoms are arranged in a hexagonal, or honeycomb, 2-D array on a planar surface. In 2010, two University of Manchester scientists received the Nobel Prize in physics for their research into this amazing material. Most recently, graphene has been used for electrodes for silicon photovoltaics in solar panel cells. Researchers are also investigating how to create super dense data storage cells. They have experimented with fabricating a 3-D nanotube made from a layer of graphene which has been curved into a cylinder (please see related article, Limits In Data Storage , for more information).